The sources of these clots most often arise from deep venous thrombosis (DVT), arising from the deep veins of the lower extremity. The treatment for this condition is normally to be placed on blood thinners (anticoagulation). Interventional Radiology is a speciality practised by Endovascular and Interventional Radiologist specialist Dr Albert Goh. It’s a minimally invasive procedure that uses small skin punctures to guide catheters inside the body, as opposed to open surgery that requires large cuts. 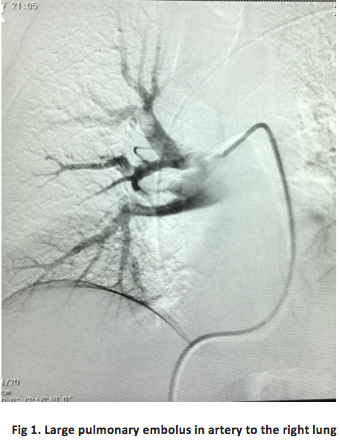 This particular procedure involved making a small needle puncture in a vein in the patient’s groin and then deploying a filter in the largest vein in the abdomen above the patient’s DVTs. Once in place, the filter expanded and attached itself to the walls of the blood vessel. It is shaped like the skeleton of an open umbrella, without the fabric. The filter’s purpose was to trap potential clots before they had a chance to travel to the lungs and heart. 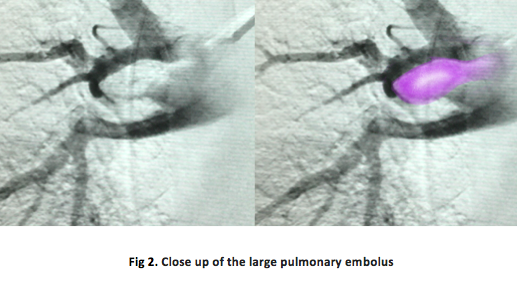 This would prevent a dislodged clot from turning into a potentially deadly pulmonary embolus. Our patient in this example experienced an uneventful post operative period, and then went on to have her tumour removed in a separate surgery, whilst the blood thinners were ceased. After the surgery, the blood thinners could be recommenced and the filter could be removed. The caval filter has a tiny hook that allows a catheter to lasso it with a snare and gently withdraw it from the body after collapsing it (just like folding an umbrella) (see X-ray diagram below). Once again, the patient experienced minimal down-time following this minimally invasive surgery, and recovered from the procedure quickly and without incident. Dr Albert Goh of Sydney Medical Interventions is a highly trained specialist in the field of interventional radiology. He offers uncompromising care with the aim to provide the highest quality of minimally invasive treatments available. If you are at risk of developing DVT, or have questions about how interventional radiology can prevent conditions such as pulmonary embolism, we are here to help. Click here to book an appointment.